At Ristorante Maria Fidone, the choice is not about what to eat, but what you will simply be unable to eat. Once I make my way through the excellent antipasti with warm focacce and a hearty pasta dish like ravioli in pork sauce, I’m stuffed before the main course arrives. 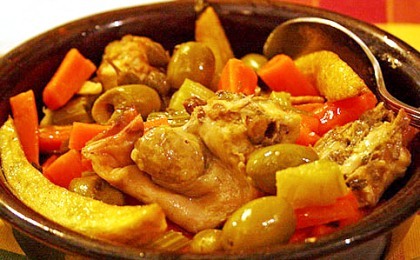 That’s too bad, because I love coniglio a’ stimpirata, rabbit cooked with potatoes, olives, mint and vinegar. The menu at Maria Fidone is fixed, and varies with the season, with special theme dinners that pack in the local crowds, such as Wednesday’s Serata dei Legumi – Legume Night. Featuring dishes made with ceci and fava beans, like lolli con le fave, a soup of fava beans and thick hand-rolled pasta, plus cheeses, home-cured olives, sausage and warm pane condito, it’s a bargain at 12 euro. Many ingredients come from nearby farms, the olive oil comes from the restaurant’s olive trees, and all the breads are made in house. On Saturdays you can take the 15 euro splurge during the Serata di Ricotta Calda, and feast on warm ricotta, freshly baked focacce stuffed with greens, and grilled sausage spiced with fennel. More often than not the brightly lit dining room will be filled with families and the noise level, particularly at Sunday lunch, can preclude conversation for those who prefer to dine without yelling. This is full-immersion into Sicilian family style dining, so make sure your lungs – as well as your stomach – are in good shape before you arrive. Begun in 1982 as a take away serving prepared dishes, Maria Fidone expanded into a restaurant in the 1990’s. Marie Fidone still heads the kitchen, using recipes she learned from her mother and grandmother, so this is traditional home cooking from the Sicilian countryside at its most genuine. House wine made with the local Nero d’Avola grape is cheap and strong, while the most expensive bottle on the wine list will set you back 14 euro. See my previous post about how to make Sicilian ravioli similar to what you find at Maria Fidone. Open for dinners only except on Sundays and holidays when it is also open for lunch. Closed Mondays. No credit cards. Located in the small town of Frigintini, about 10 kilometers from Modica in eastern Sicily. 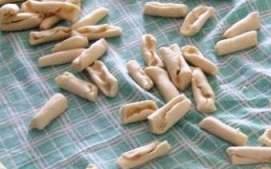 I love Maria Fidone but did not know about the special evenings with legumes and ricotta calda . Now I have more reasons to return. Glad to hear you are a fan of Maria Fidone, an eatery that is like stepping back in time. Hope we can get together the next time you are in Frigintini. The Maria Fidone trattoria is in the town of Frigintini, about 5 km from Modica. Don’t expect quaint, just straightforward adn genuine. In the center of Modica, there is the Osteria dei Sapori Perduti, which is good, traditional, and inexpensive with outdoor seating, too. Have a great trip!